On March 18th, 28 premiers of EU were in Brussels to confirm a deal to halt illegal migration flows with the turkish premier Davutoglu. The agreement aims to deport to Turkey all migrants arrived in Greece since March 20th, together with people already in Greece classified as “economic migrants”. Basically, this is the final elimination of the already limited right of asylum: who will face EU policies arriving in the islands will have no chances of “legal” resettlement. There remains only the promise of EU countries to relocate several thousand Syrians directly from Turkey. Since the day after, the forced evacuation of the migrants already present in the islands began, for giving place to the new arrivals in the hotspots. Turkey sent its agents in the hotspots on the islands to coordinate the deportations, and Greece own officials in Turkey in the places where the future deportees will arrive. Moreover, to carry out the deportations is expected the deployment of 250 Greek policemen, 50 Frontex experts, 1500 police officers from EU countries under Frontex’s command, 1000 military and security guards, 8 Frontex ships with 400 seats, 28 bus. On March 24th, we learnt that 30 Pakistans and Afgans were deported to Turkey. They were moved from the self-organized camp “Better day for Moria”, first to the hotspot in Lesbo by deception and the promise of being able to apply for asylum, then taken on a ferry, handcuffed and locked in police vans, and finally inprisoned in the detention center of Corinth. They are the first people expelled since the ratification of the deal, but throughout this year, already 800 migrants were deported to Turkey from the 7 detention center in the country, having a capacity of 6127 seats and where 1187 migrants are detained, up until March 23th: 231 people in Amygdaleza, 315 in Corinth, 161 in Petrou Ralli, 317 in Paranesti, 151 in Xanthi and 12 in Orestiada (in addition to more than 4000 people in the hotspot on the islands). Greece is turning into a large camp of concentration and expulsion. Despite the dramatic situation, struggle and resistance of migrants and solidarity protests go on daily. We support and spread the call written by SoliConvoy to sustain migrants struggle in Idomeni and wherever, organizing and increasing protests in our cities and districts, in the streets, on the borders. The border is everywhere. Shown below a chronology of protests happened in Greece in recent days, based on the news spread by migrants and supporters. 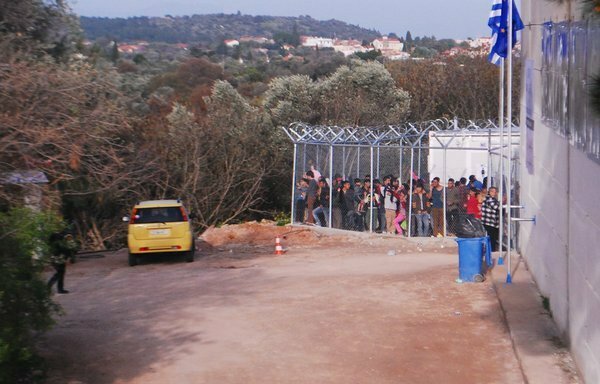 Lesbos – In the morning, police tried to close the solidarity kitchen “No Border kitchen” and identify people who were there. When they refused, police threatened to come back the day after for arrest them. At 1:30 pm, about 300 people took part in the demo in solidarity with the struggle of migrants detained in the hotspot of Moria, against deportations and expulsions. In addition to the police already standing in the center, two riot police squads arrived there too. Detained migrants joined the protest but a direct contact with supporters was no possible because the police cordon around the fence. 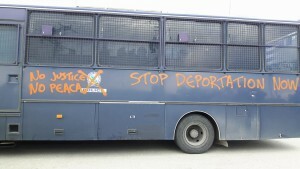 There were two short attacks of the police and the arrest of a “Team Platanos”member, accused of writing “Stop deportation now” on the police bus. A gathering at the police station of the island was organised later to ask for his release, and also a flyering among the population in Mytilene for the next demo on Saturday at the port. Nea Karvali – The 738 migrants in the government camp, near the town of Kavala, after some days of oppressions by the police, which led into the police station whoever complained for the situation in the camp, organized a protest and a hunger strike, against the life conditions in the camp and for opening the borders. Idomeni – In the morning, as decided in the assembly of the previous day, about 100 people headed down the road to the customs of Evzoni to demand the opening of the border with Macedonia / FYROM. A police cordon stopped them for a few hours. During the day, also the railway blockade started again and, despite the intimidation of the police, it went on all night long. Some people carry on the hunger strike. Polykastro – In the militarized camp of Nea Kavala (22km from Idomeni), 3515 migrants live in awful conditions, in flooded tents, with no water and no news about their future. Today, about 500 people left the camp and moved towards Polykastro. Here, from 11 am, they blocked both carriageways leading from Thessaloniki to the greek-macedonian border. 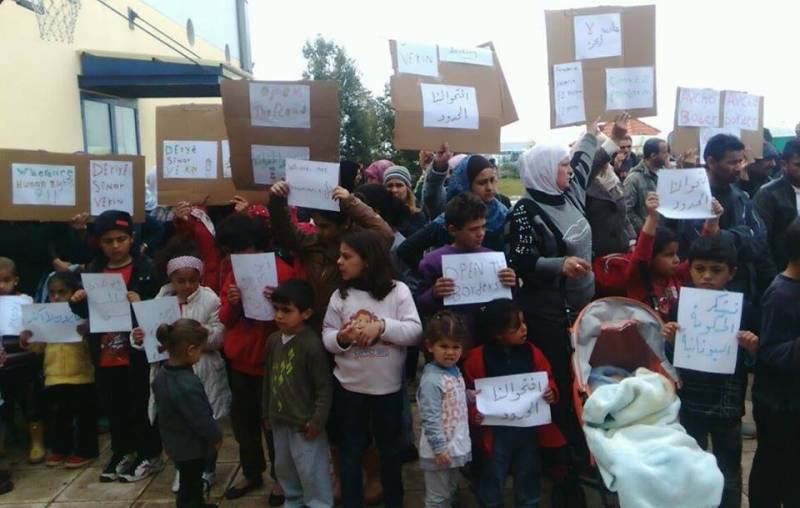 Solidarity groups and other migrants, from the camp of 2000 people set at the service station of Polykastro, joined the protest. 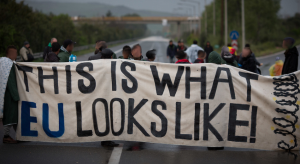 “If you block the border to the people, then we block it to the goods” claimed the protesters. Banners said in more languages “This is what EU looks like!”, “No Border No Nation Stop Deportation”, “open the borders”. A little camp was set up there and the rally went on in the afternoon. Riot police came and tried to push away all migrants, who were not intimidated and lined up in cordons. Policemen were forced to keep the distance and the blockade continued until the next morning. 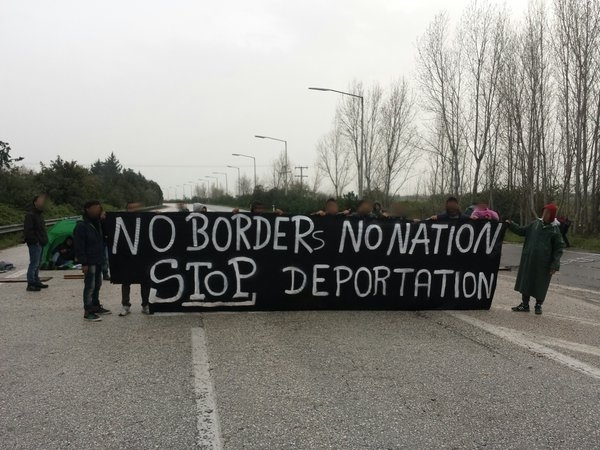 Thessaloniki – Migrants living in the city’s port area organized a rally at the pier n.10 of the port, asking for opening the borders. Piraeus – This morning, 160 migrants refused to go on the buses directed to the government camps. In the port area, more than 4000 people are camped, and the majority refuse to be segregated in centers, fearing of being blocked and expelled. To push them to leave, for the start of the tourist season when foreign tourists will crowd the port, national and local authorities don’t provide any type of support, which is instead ensured, as far as possible , by groups of volunteers and supporters. In the afternoon, there was an assembly between the solidarity coordination, including also trade union workers, and migrants. In the evening, as in the previous days, a march moved on through the streets of the port. 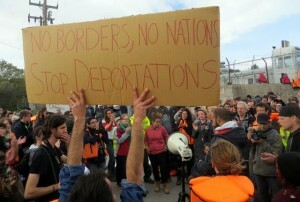 On March 21th, after the assembly, another march was headed for the Frontex offices in protest. Chios – In the Vial hotspot there are about 1100 migrants detained, including many minors. Lots of them sleep outside, there are no food, milk, water, electricity nor blankets. Supporters and activists who reached the center in the afternoon, as in previous days, were stopped and identified by police, then turned away. Meanwhile, in the center a strong protest started and all operators and the police came out. There were also brawls between migrants, with some injured people. It seems that the police was able to return to the center only in the evening. Lesbos – Three migrants tried to go to the port to board a ferry and leave the island, but they were stopped by dutch agents of Frontex and detained in Moria hotspot. Ritsona – In this camp, where 908 people live in tents, without electricity, water and with insufficient food, protests continue. 4 people carry on their hunger strike since a few days. In a statement they affirm “Our main goal is to reach Europe. They put us in a place where also the animals could not survive. We decided to start a hunger strike and will stop only when the borders will be opened. We are supported by all migrants detained in Ritsona”. Idomeni – A group of migrants spent the night on the train tracks, where the protest continued since yesterday. Greek police dismissed them violently, sparking greater protests: hundreds people joined migrants and blocked together again and completely the railway. At one point, two exasperated people set themselves on fire, and were quickly brought to the hospital by ambulance. 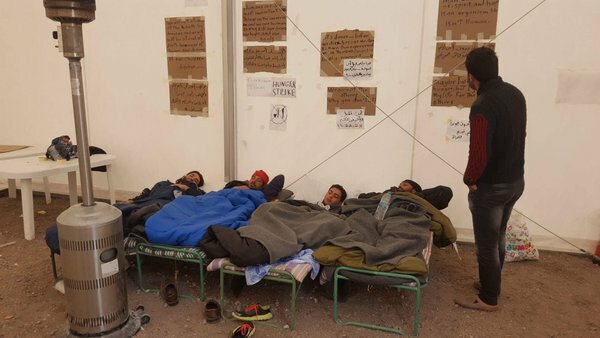 Some migrants started a hunger strike, demanding to the NGO Praxis van don’t deliver food in the camp, and refusing food in the camp, in protest. Protests were repressed also with a water cannon. Lesbos – Hundreds of migrants detained in the Moria hotspost protested against their detention. Just landed on the island, according to the agreement between the EU and Turkey, they were immediately segregated in the detention center. There are about 600 migrants detained, including 130 minors, in awful conditions. On the posters they wrote: “We want to know destiny. We want to go to Athens”. Journalists and supporters are not being allowed into the camp; in the interviews conducted through fences, migrants demanding answers, they want to know what will be their future and whether their documents will be released. 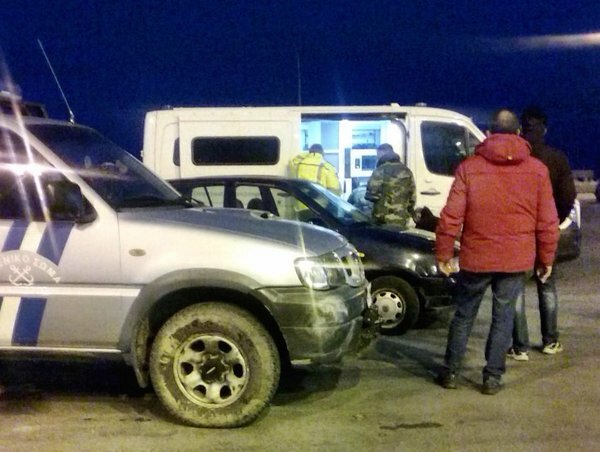 Chios – Activists went to the Vian hotspot in the afternoon, to support and provide food to more than 1100 people imprisoned in the detention center. Meanwhile, a strong protest was realized by migrants inside. 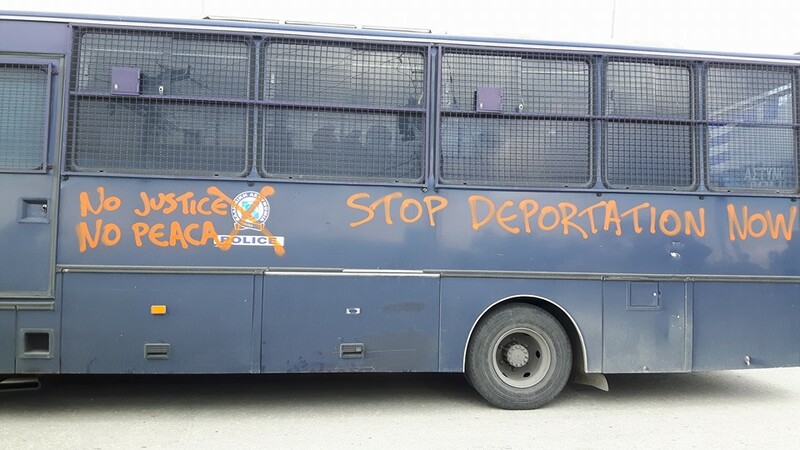 Supporters were stopped by the police, identified, their car searched, and then brought and held for 5 hours in the police station of the island, where they were interrogated and filmed. In the evening, they came back to the hotspot, where the protest continued inside. The police was in riot gear, and a policeman with a gun in his hand stopped again the supporters to ask their documents. Police again searched them and their car, saying “you shoudn’t stay here, this is a prison now”. Samos – The about 600 people detained in the hotspot organized a demo to ask the opening of the gates of the camp and allow them freedom of movement, the acceleration of the procedure for the document, and the chance to eat in the “lokasti’s kitchen” where, until a short time ago, some women of Samos have prepared meals for migrants, in solidarity. 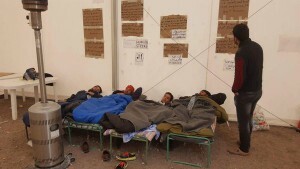 Ritsona – Hundreds of migrants in march inside and outside the camp. They want to leave the camp and Greece, and ask for opening the border. 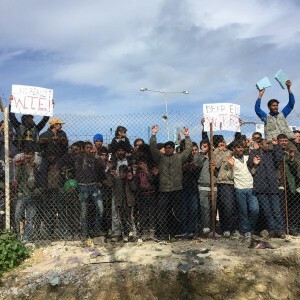 Ioannina – 700 people stay in the center run by soldiers of greek army and set at the former military airport in the suburb of Katsikas, in the region of Epirus. For days, migrants are protesting for the overcrowding, the cold, the tents that flood when it rains, poor food, lack of hot water and electricity, the uncertainty about their future. Many want to return to Athens, to rejoin their friends and family from which they were forcibly separated when, just arrived in the Piraeus port, they were directly carried on buses and brought here. Some of them already left the camp. Today 200 people marched for “leaving the hell”. This entry was posted in dalle Frontiere, dalle Galere, General and tagged Chios, deportation, detention, Greece, hotspot, Idomeni, Lesbos, Samos, struggles, Thessaloniki. Bookmark the permalink.